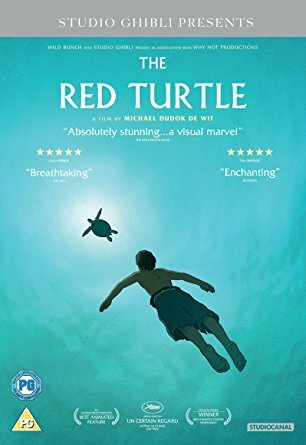 ‘The Red Turtle’ is an animated movie by Dutch film-maker Michael de Wit. Studio Ghibli appear in the producer credits, but their involvement seems to have been minimal. This hand-drawn animation shows a man stranded on a deserted tropical island. He tries to leave the island by constructing increasingly elaborate bamboo rafts, but each time he launches, a giant red turtle smashes the raft to bits, forcing the man to swim back to shore. More surprising events ensue. There is no dialogue. To be honest, after the rave reviews in the quality press, I expected much of this, but was disappointed. The story isn’t much, and the animation, despite some nice touches and the detailed depiction of the rafts, does not look as interesting as a typical Studio Ghibli production. The screen is often occupied by large areas of uniform and uninteresting texture, and there are a lot of scenes, apparently representing dusk, in near monochrome. As an amateur astronomer I was irritated by the generic random-dot depiction of the night-sky and moon. With a substantial budget they could have made this look more realistic. The night sky isn’t copyright.